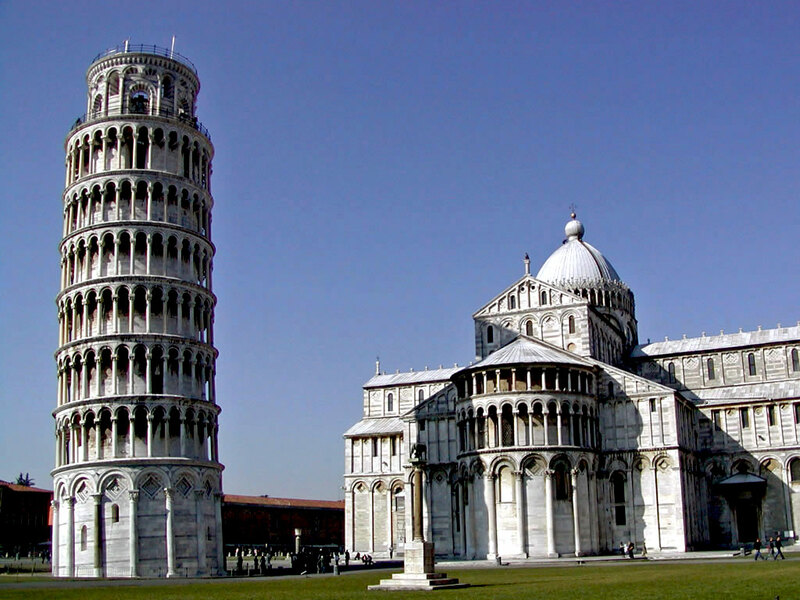 This tour starts from the famous town of Pisa, known worldwide for its Leaning Tower (the bell tower of the city’s cathedral). 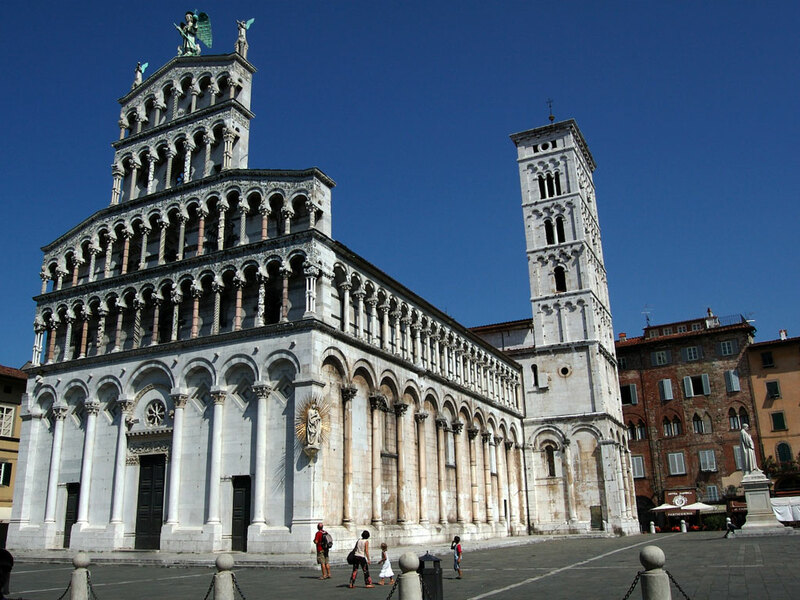 But the city is also home of the University of Pisa, which has a history going back to the 12th century and boasts more than 20 other historic churches, several beautiful historic palaces and various bridges across the River Arno. 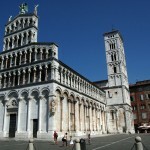 The city of Lucca is deemed to be one of the most charming of Tuscany. 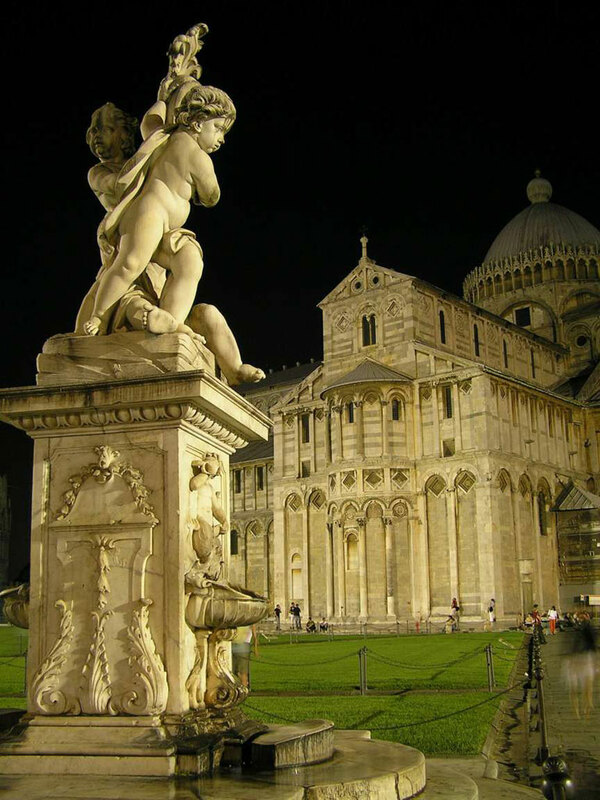 Its centre is completely surrounded by Renaissance town walls, and its heart is an amazing town square, in the shape of the old Roman amphitheatre. Strolling through its pedestrian streets is a real pleasure. 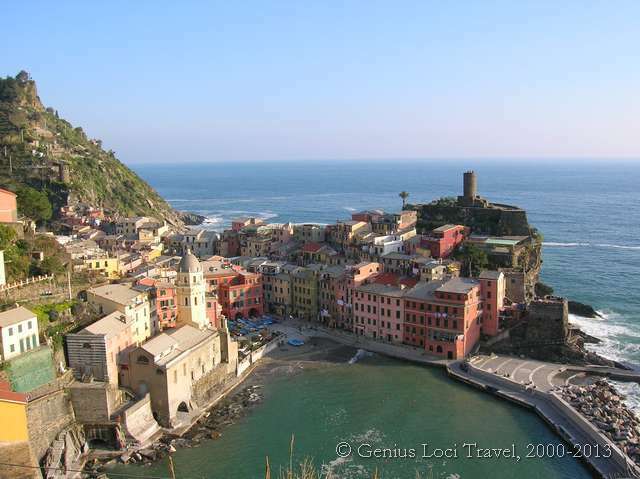 The ‘Cinque Terre’ gets its name from the five picturesque villages of Monterosso, Vernazza, Corniglia, Manarola and Riomaggiore. The area, now a major National Park, is a unique part of Italy. For over a thousand years people have lived in this dramatic landscape, slowly altering its features and cultivating the steep hillsides that lead down to rocky shores. An extensive network of ancient mule tracks – today used as footpaths- take you through an extraordinary landscape of terraces, built by hand with stones and earth. 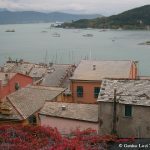 But the Region of Liguria has more to offer: the nearby small towns of Portovenere, and Levanto, a charming medieval town with a broad beach and of course the romantic island of Palmaria, in the Gulf of Poets, just off the coast in front of Portovenere. This is a moderately easy tour which is suitable for those who have some experience with walking and a good general physical condition. 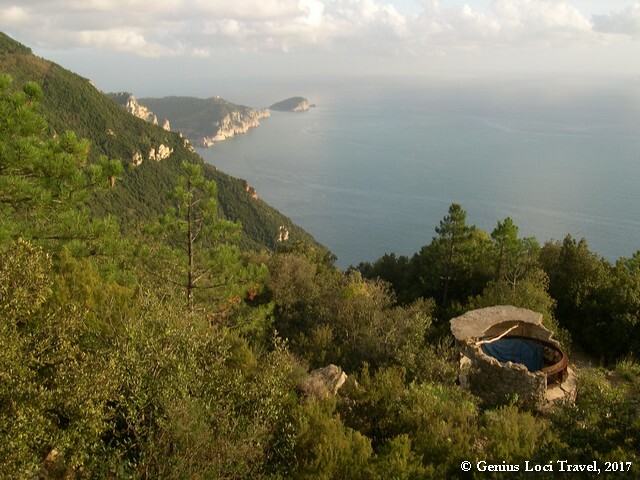 Through the extensive footpath network of the area you walk from village to village, between forest and vineyards, through a spectacular terraced landscape overlooking the sea. 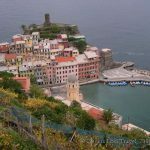 You have also the time to visit the historic towns of Levanto, Portovenere and of course the five charming villages which make up the ‘Cinque Terre’, little gems of colourful houses in a green landscape. 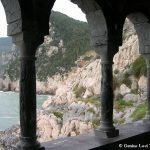 Another highlight is the small island of Palmaria, just off the coast from Portovenere, at the entrance of the ‘Gulf of Poets’. Walking here is an unforgettable experience! 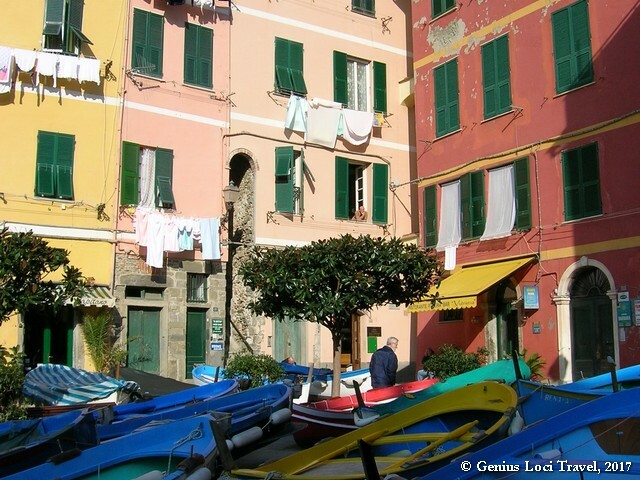 Today is day is the first walking day on the Cinque Terre. 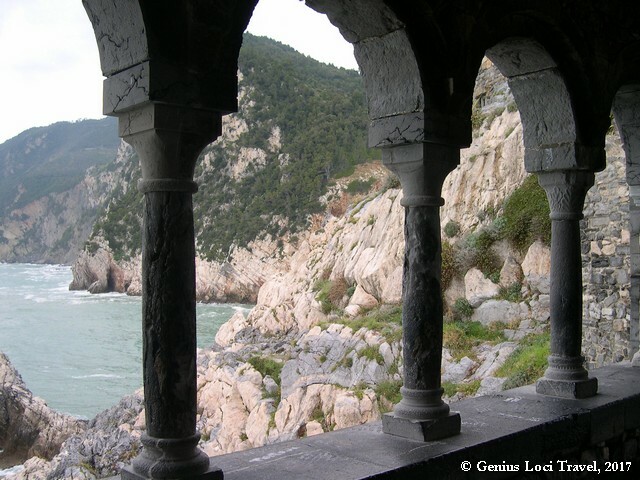 By train you travel from Pisa to Levanto. After settling in your hotel there is time for a short visit to the town centre and buy your picnic supplies. 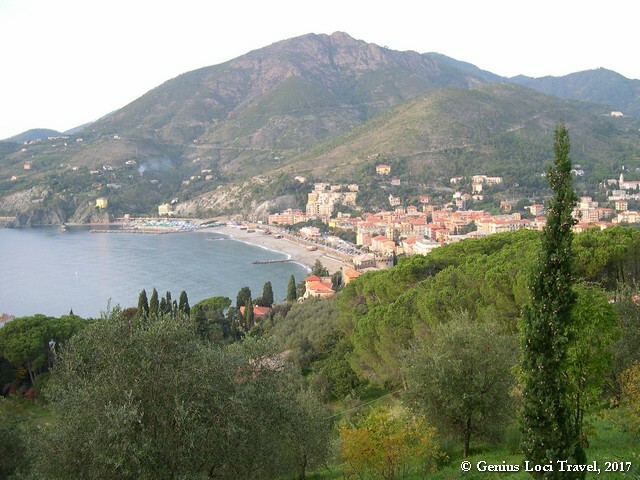 Then you start your first day walk, which takes you along the coast to Monterosso al Mare. The first part of the walk leads up towards Punta Mesco, the most notable promontory in the region. This is a good spot to stop for a picnic lunch. 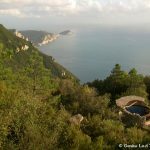 Just short of the point you can make a small detour to the ruins of an old 11th century hermitage and the nearby ‘semaforo’, from where you will enjoy marvellous views of the rugged coastline. 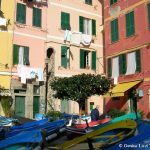 Then you follow a fairly steep path down into Monterosso, a colourful village, with blue, red & yellow houses that cluster behind the beachfront. There is then time to explore the town before taking the local train back to Levanto. 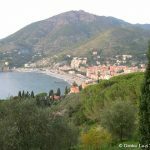 For those who want there is also the option to walk back from here, following a more inland forested path, which over the ridge brings us back behind the castle of Levanto. Accommodation is on a bed and breakfast basis in 3-star quality hotels. All rooms have en-suite facilities. You will be free to organise your dinner from the wide choice of restaurants in the area. No picnic lunches are included in the tour price; these can be prepared for you or materials for picnics can easily be purchased in the villages. Nights 1 & 2: The first two nights are spent in Pisa. Here we stay in a comfortable 3-star hotel in the old town centre, centrally located at walking distance from the train station, all the main monuments of the medieval town centre and close to many nice restaurants. Nights 3, 4 & 5: These are spent at Levanto, a nice old medieval city. Here we stay in a welcoming and comfortable 3 star hotel, centrally located at walking distance from the train station, all the main monuments of the medieval town centre and the sea shore. 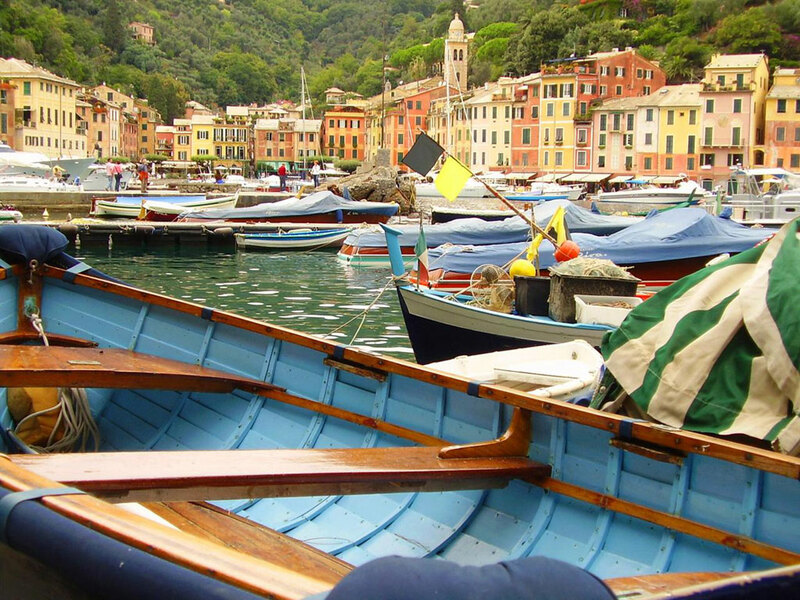 Nights 6 & 7: These nights are spent in the beautiful fishing village of Portovenere, on the Gulf of the Poets, in a comfortable hotel, overlooking the Bay. 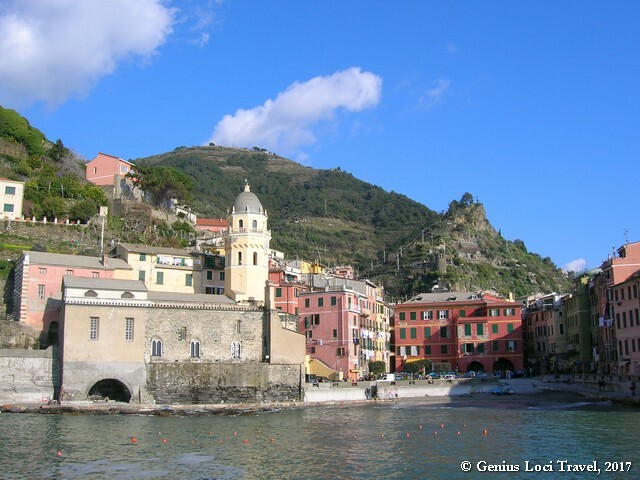 UPGRADE: It is possible to do this tour, staying in more luxurious 3/4-star hotels (only in Levanto and Monterosso). FOOT PATHS: A large part of the route is waymarked; elsewhere it is necessary to follow the route descriptions provided together with the maps. Most paths are well maintained, but the journey involves some walking uphill, sometimes on paths with rough surfaces. ARRIVAL: The tour starts in Pisa. 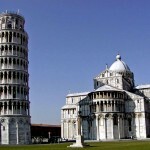 Pisa Airport offers many low-cost flights from/to destinations all over Europe. Also are there frequent trains from all directions. 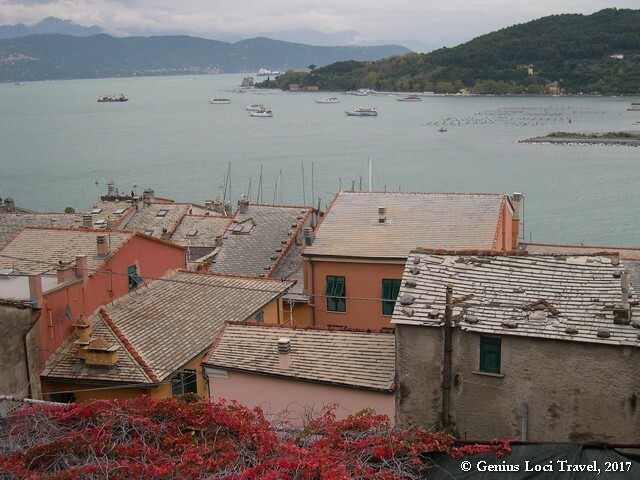 END OF TOUR: The tour ends after breakfast on day 8 in Portovenere. The return to Pisa (Airport) is most easily made by train. Extra days can be booked in any of the accommodations ‘en route’. Extra walking options will be provided!!! N.B. The very frequent trains, which link all the villages, make it easy to modify the programme. It gives you all the freedom to do the walks in your own rhythm, or alternatively, do some sightseeing. 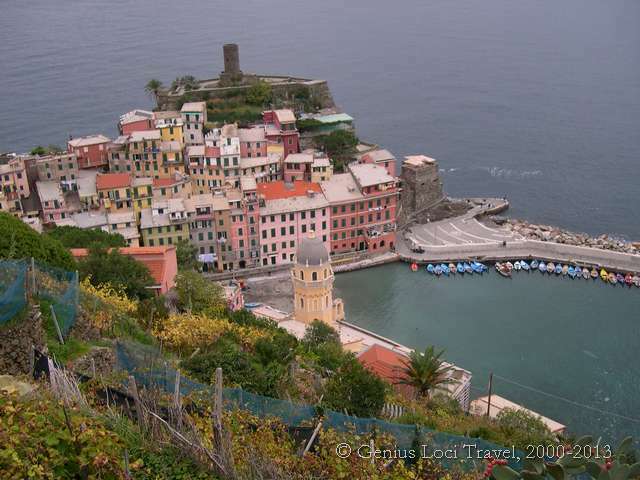 Therefore it is also possible to opt for different accommodations on the Cinque Terre, without changing the walks. This one accommodation can either be Levanto, Monterosso – the biggest village of the Cinque Terre – or charming Riomaggiore (we usually opt for Levanto, a slightly bigger place, more ‘lively’, with a good choice of restaurants and a broad beach), but according to availability and/or special requests it is possible to substitute these days in Levanto. 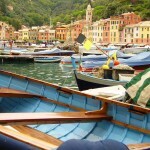 This makes it possible to opt for only one accommodation on the Cinque Terre. 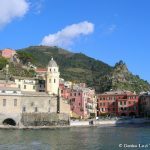 This one accommodation can either be Levanto, Monterosso or Riomaggiore, according to availability and/or special requests. 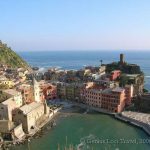 At the beginning or the end of the tour there is also an opportunity to visit Genova and/or Pisa / Florence, or spend some time on the beach, somewhere in Liguria. 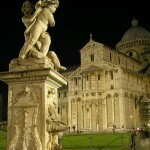 The tour can easily be extended with a few extra days in Pisa or Florence. Several good accommodations are available. Details & prices on request. Also longer 11- and 12-day versions are available. Prices on request. Also shorter 5- and 6-day versions are available. Prices on request.